Chandigarh railway station is a train station situated in Chandigarh, capital city of Punjab. The station is the chief station of the city. It is a modern train station equipped with all of the modern amenities required by passengers of today. Chandigarh serves as the capital city of Punjab. It is also amongst the first and the best planned cities of India. Originally, the popular French architect planned and designed the city. The symmetry and amazing planning of the city mesmerizes tourists who pour in from all over the world. Being the capital city of Punjab state, it is a hub for technology and development. The city was originally named after Goddess Chandi (the Goddess of Power). Interestingly, it is the shared capital of the states of Haryana and Punjab. The place makes for an amazing holiday destination for both locals and tourists. It is home to a huge number of beautiful innovative parks in order to impress the tourists. They love to enjoy the taste of modern architecture and natural beauty. You would certainly enjoy the beauty of parks, lakes, etc. Chandigarh is very popular among ardent nature lovers who visit this place just to experience the mesmerizing theme gardens. Also the grand eye catching reservoirs in Chandigarh are worth seeing. Some of the most popular tourist sites of Chandigarh include Rock garden, Sukhna lake, Leisure valley, Open hand monument, Capitol complex, and Sector 17 Market. Hiring a taxi in Chandigarh will help you enjoy the tour in Punjab and areas around better. 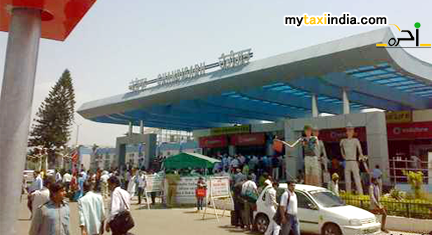 At My Taxi India, we are fanatical about fulfilling requirements of our customers. If it is about a tour to Chandigarh and various other parts of Punjab, we believe in surpassing the expectations of our clients at all levels. The services offered here aim to ensure highly efficient and comfortable tour experience. With us, it is always about enjoying the unprecedented car hire and Railway Transfer service in Punjab. Our customer care representatives will be more than happy to attend to your queries and concerns right from the start of the tour till the end. If you are looking forward to visit Chandigarh, give us a chance to help you with the best facilities. Book a taxi with MY Taxi India and experience the difference.